The GeniSys Advanced Burner Control from Beckett is a 120 VAC primary safety control for light commercial oil burners in boiler, furnace and water heater applications. It has three diagnostic lights, welded relay protection with redundant motor relays, limited reset and limited recycle, and a sleek, modern design. The controller also offers advanced features including a technician's pump priming mode, a cad cell resistance indicator, and a disable function, all of which are accessed by pressing the control's lighted reset button. A pair of communication ports allow for snap-on modules and greater flexibility. 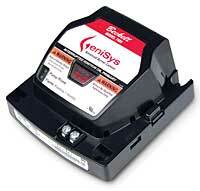 The snap-on alarm module can add alarm contacts to any standard control. GeniSys is compatible with almost all thermostat and boiler controls, and it is used with a cad cell flame sensor to control the oil burner motor, igniter, and valve. It has 24 VAC thermostat terminals compatible with both on/off and many power stealing thermostats. It can provide interrupted or intermittent duty ignition.